Well it may be autumn but it certainly feels like winter. The max/min thermometer in the polytunnel showing it had dropped to 0.7ºC overnight. And it’s set to get colder as Arctic winds sweep down from the north. I hate it when the clocks change. In the summer losing an hour of precious sleep and in the winter the dark arrives even earlier. Yet that extra hour gained in the morning never gets put to much use. Or maybe that’s just me. The last couple of kilos of tomatoes came out of the greenhouse and polytunnel. Most are still green but rather than ripen them up indoors, Val’s trying a new green tomato chutney recipe which I’m looking forward to trying when she declares it ripe. I love it when she’s making chutneys. That rich, deep vinegary smell which permeates the house is so full of promise. The cucumber plant came out as well. There were a couple of mature fruits and half a dozen immature, small cukes that the hens will appreciate as a treat. That’s it for plants in the greenhouse so just the borders to go over, cleaning and fumigating before moving the benches back in when the quadgrows are out of the way. There’s a few weeds popping up in the greenhouse border, including the chickweed that seems to be a plague this year. Another treat for the chickens! I’ll pull the roots of the tomatoes and cucumber up to compost and remove the soil around where they were. 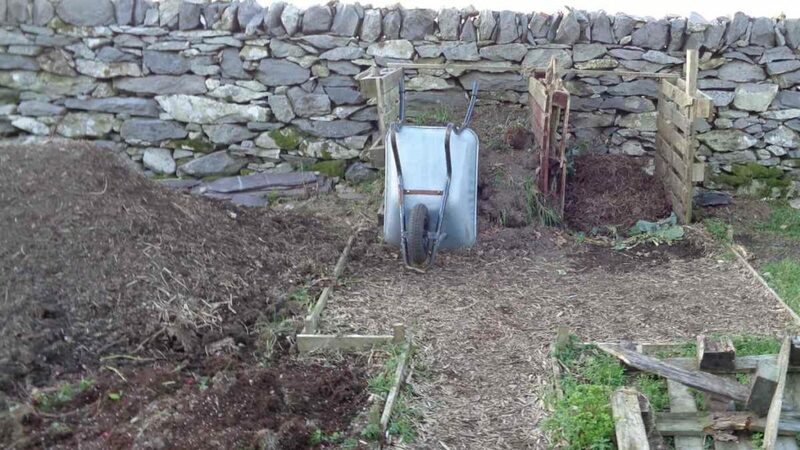 That will be replaced with fresh compost / soil to stop disease and nutritional deficiencies building up. In an ideal world I suppose I’d replace the border soil, adding manure and compost every year. In practice it’s not totally necessary, I think a complete replacement every two or three years is worth the effort though. Not so much for nutrients which can be added each year but because you tend to be growing the same thing year after year and illness will build up. 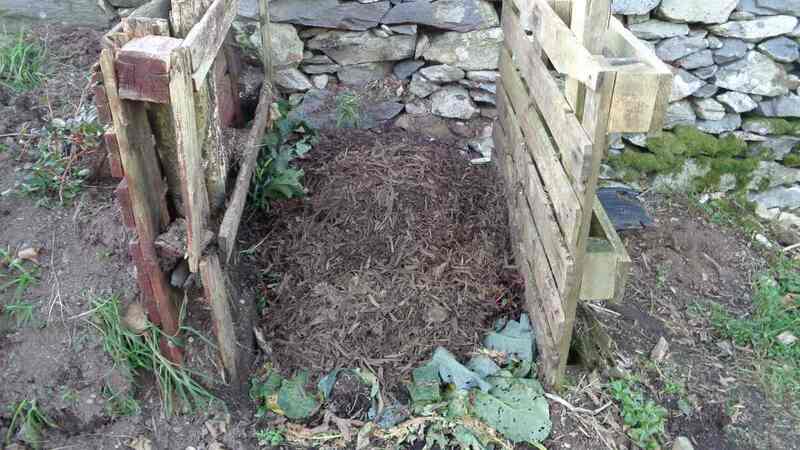 Bark Peelings Composting – Thanks to the hens for the activator! My neighbours have a friendly tree surgeon dropping wood chippings off for them and they’re generously bringing some down to me in their electric tipper truck. It’s not road legal but they find it useful for shifting stuff around their smallholding. It was bought second hand and they had to replace batteries and various parts but as one of them is a retired electronic engineer he overcame the challenges. One pile topped off the chippings in the field plots and they dropped a second load for me by the walled veg garden. Most of that has gone into the replacing the bark chippings in the hen’s secure run. They, mixed with the high nitrogen droppings and more green stuff will gently rot down into compost over the winter. 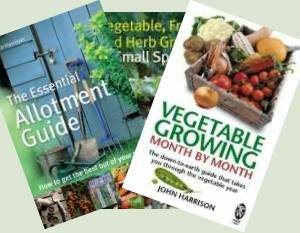 Most people nowadays think of parsley as a pot plant you pick up from the supermarket and clip off a decorative sprig to pop on a meal. Older recipe books used much larger quantities of parsley though and it sometimes seemed that every dish would have parsley in it. It’s not something that works as a side vegetable but it’s a great addition to many dishes or as a sprinkled garnish over them. Parsley is extremely good for you, almost a superfood. It’s extremely high in vitamin K which is essential for blood clotting and healthy bones. It has a justified reputation for being hard to grow because germination can be slow and often fails. One old method was to sterilise the planting drill with boiling water – see video on how to get parsley to germinate – but I think the easiest way is to start it off in modules in the greenhouse. 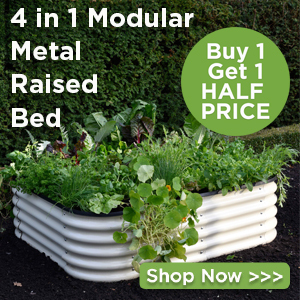 I just use a multi-purpose compost and sow 4 or 5 seeds per module (15 to a tray). Then cover the seed lightly giving about 25ºC bottom heat. You could do that indoors over a radiator if you don’t have a propagator. 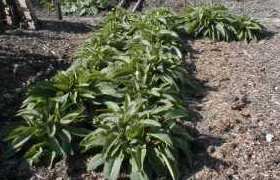 Once established, plant out the modules about 20cm apart in rows about 30cm apart. 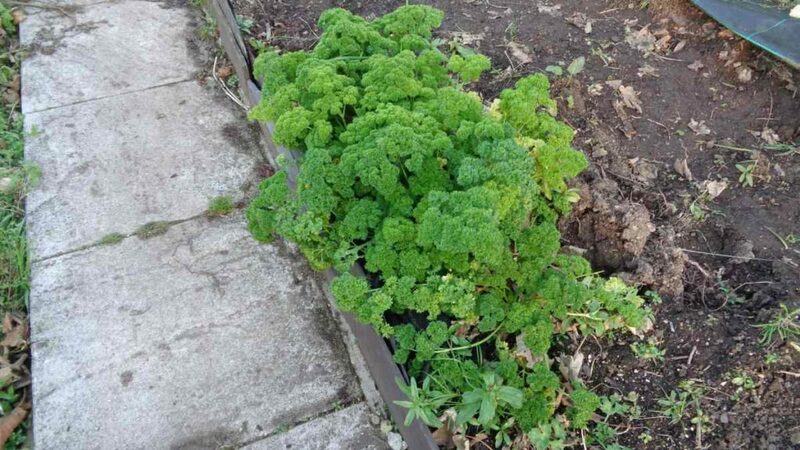 My Grandad always had parsley in his garden. He used to grow it in the soot that the sweep took out of the chimney and it was very plentiful and made delicious parsley sauce for the fish on Fridays. If you are a Raspberry lover like what we is, then put any wood chip to very good use. Instead of mulching your rasps in spring try using a good covering with chippings or bark. The wood is acid and has iron in it(ericaeous-not sure of spelling). Add a bit of chicken pellets when growth starts. The taste and size is fantastic. That’s an interesting idea, Derek. I’ll maybe try that. Probably sow too thick because they stay dwarf like you say until planted outdoors. We some times sell a few pots because my wife says its bad luck to give it away. In some parts of the world and even in the UK it is said that to ensure success with plants you have to steal them!